The workshop held at Addis Ababa University was titled “Environment, Livelihood and Local Praxis in Asia and Africa.” Presentations were given by 16 graduate students of ASAFAS (12 from the Division of African Area Studies, and 4 from the Division of Southeast Asian Area Studies) and 4 graduate students of Addis Ababa University. The workshop, which continued for three days, saw lively discussions. The students and teachers of ASAFAS stayed at the same hotel, enabling us to have intensive time for learning together while attending the workshop. It was also a rare chance for us to receive critical comments of Ethiopian scholars, from various local perspectives, to the presentations by the Japanese students. For a program and abstracts of the presentations, and for details of Field Study Tour, please see, http://areainfo.asafas.kyoto-u.ac.jp/efs/e/workshop.html. 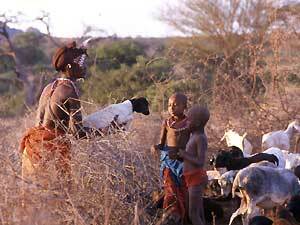 In Kenya, Mr. Naoki Naito, an ASAFAS graduate student (year of enrollment: 1999), has conducted field research on the “Formation of multiple ethnic identities among the Ariaal pastoralists.” The Ariaal live between two distinct ethnic groups, the Samburu and Rendille. The Rendille speak an Afro-Asiatic language, while the Samburu speak a Nilo-Saharan one; the two are completely different. The Ariaal do not have their own language, but are bilingual in the other two. They have also adopted age and descent systems from the Rendille and Samburu, modifying them for their convenience. Mr. Naito is exploring the processes through which peoples' identities are created, negotiated, and maintained in the boundaries between these three groups, and how regional society is formed through these processes. He made a presentation at a seminar held at the Nairobi Field Station. Professor Tanaka of ASAFAS also attended the seminar, and we discussed Mr. Naito's pursuit of his research theme. We are planning to open a web page for the Nairobi Field Station in the near future. At the Station, I set up an internet connection in order to make it possible to update the page from the Station. 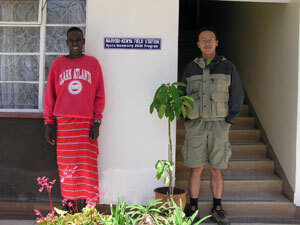 Mr. Sun Xiaogang, a graduate student of ASAFAS, and Mr. Saimon, a Kenyan research assistant of another ASAFAS student, Ms. Kyoko Nakamura, in front of the Nairobi Field Station (photo by Mr. Sun). A herd of goats and sheep return in the evening from a day-trip herding. Young members of the Ariaal try to increase their livestock herds by giving priority to the raising of goats and sheep, which multiply faster than cattle and camels (photo by Mr. Naito).